a high-temperature adhesive/sealant is required. 2 grades: +260°C and +300°C continuous. as a dip for sleeve and rope. Non corrosive and meets Mil-A-46146 as per NAVAIR 01-1A-20. 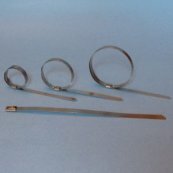 Stainless steel clamps are used to secure firesleeve to the body of the hose fitting or for general securing of sleeve and tape to wires, cables, pipes, etc. Pre-formed Twice-Around Stainless Steel band clamps are available in sizes from 13/16" ID through 4 1/2" ID in 201 and 316 Stainless Steel. Single-End Self-Locking Stainless Steel Clamps are available in .181" and .311" widths and in lengths from 6" to 33". 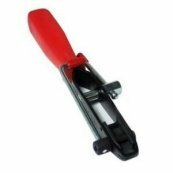 Single-End Stainless Steel Clamps that require fold-over to secure are available in 1/4 and 3/8" widths. After clamping, the assembly may be finished with SleeveSeal paste or End Wrap Tape. Clamps may be tightened with common tools, but specific designed clamp tools are available which make installation quick and easy. 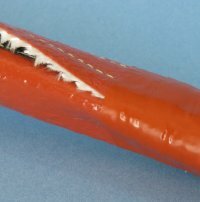 This high temperature, heat and flame resistant silicone rubber end wrap tape is the perfect choice for sealing the ends of firesleeve, thereby preventing the firesleeve from wicking liquids such as water, oil or hydraulic fluid. 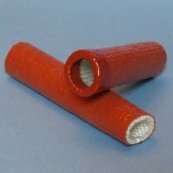 This silicone tape can also be used to help secure other types of fiberglass and silica tapes over wires, cables, hoses, tube and pipe.. The tape has a blue stripe running down the centre as an aid to performing a standard 50% overlap when wrapping the tape around Sleeve, hoses and cables. 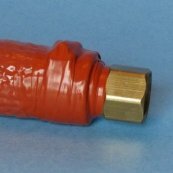 End-wrap silicone rubber tape is self bonding to itself and other silicone rubber sleeve and tape, providing a waterproof/air tight end to the installation of firesleeve sleeve over hoses and cables. This tape is available in 1" and 1 1/2" widths (25 & 37mm), with 36 feet of tape per roll. The tape is mounted on a backing film for easy unwinding. Also available meeting specification A-A-59163 and Mil-I-46852. 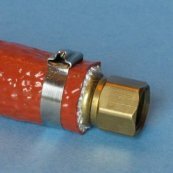 This photo shows a firesleeve with velcro in place wrapped around a cable. The overlapping edge of the right-hand section of the sleeve is sealed with a spiral wrap of end wrap tape, completely sealing the sleeve from exposure to contamination. The end wrap tape can be easily removed if necessary, allowing the velcro sleeve to be opened or removed from its installation. 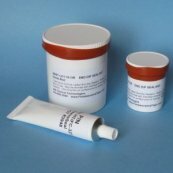 The shelf life of uncured liquid silicone rubber end dip can be greatly extended by keeping the closed container inside an airtight container or bag, along with a desiccant pack. The desiccant pack is regenerable to make it reuseable indefinately.